This attractive dish can be used as a light desert, snack, appetizer or even for breakfast or brunch. Make sure the soy yogurt is very cold and carefully put it over the cranberry sauce otherwise it will quickly mix instead of layering. Mix the soy yogurt with the vanilla sugar. Place a layer of cranberry sauce in the bottom of a pretty glass (up to about to the half way point) . 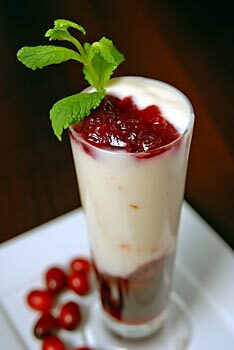 Carefully layer the yogurt on top of the cranberry sauce to the top of the glass. On the very top you can put a few cranberry pieces, or red currents, a thin layer of cranberry juice. Garnish with a couple of mint leaves. Posted by Chris Walker on December 7, 2006 in Appetizers, Cranberry, Desserts and Sweets, Soy yogurt.